Prime Minister Erna Solberg and both her justice and defense ministers face a grilling by the Parliament’s disciplinary committee right after the summer holidays. They’ll be hit with lots of tough questions over why the government allegedly has failed to follow through on securing public buildings against terrorist attack. The committe called for a hearing to be held, most likely in late August, after the state auditor general’s office blasted Solberg’s government for what it views as a lack of preparedness for a terrorist attack. The auditor general claims that errors, deficiencies and weaknesses in security that were pointed out last year still have not been addressed. The auditor general’s initial report came six years after the Norwegian government and the Norwegian Labour Party’s youth organization were both targeted by a right-wing extremist in 2011. He bombed the government complex in downtown Oslo before launching a massacre at Labour’s summer camp on the island of Utøya. A total of 77 people were killed and scores more injured, while the former government ministries remain in ruins. The former Labour-led government coalition was also harshly criticized in its time for a lack of security around public buildings. 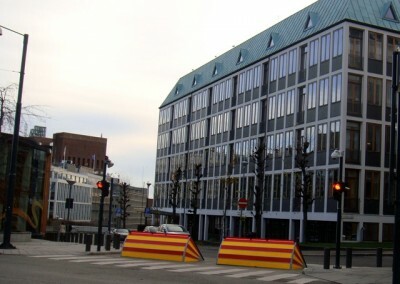 Norway prides itself on being an open society, and both city and state officials in Oslo have long resisted calls to close off streets around the ministries or impose other visible security measures. Solberg’s conservative coalition, which took over after Labour in 2013, was then charged with moving forward with security improvements. According to the auditor general, it has failed almost as badly as its predecessors. Solberg, Justice Minister Tor Mikkel Wara and Defense Minister Frank Bakke-Jensen will be called in to the hearing, along with several former ministers and other officials responsible for security and defense. Foreign Minister Ine Eriksen Søreide, who served as defense minister before Bakke-Jensen, is also expected to be “invited” to submit to questioning along with former justice ministers Sylvi Listhaug and Per-Willy Amundsen. Søreide has earlier claimed that the government carried out a long list of measures, “but at the same time, we were very clear that this job isn’t done in a year or three.” Her remarks have been seized upon by other government ministers now faced with defending themselves. “We have been completely open that this is challenging,” Bakke-Jensen told NTB. “There’s a lot of work to be done and it takes time.” Officials at the Royal Palace in Oslo, meanwhile, have admitted they’ve put off making visible security enhancements but work is finally set to begin on construction of barriers that will control vehicular traffic to the palace.